A rendering of the future Long Island City North ferry landing, which will open in 2017 at the northern end of Gantry Plaza State Park. HUNTERS POINT — The new ferry dock planned for Long Island City as part of Mayor Bill de Blasio's 2017 Citywide Ferry service launch will be located on the northern end of Gantry Plaza State Park, officials said Monday. The landing — which will operate in addition to the existing East River Ferry dock further south in Hunters Point — will be constructed on the park's shore at the northernmost end of Center Boulevard, just south of the Anable Basin inlet. The location is one of two sites the city had been eyeing for the neighborhood's new ferry dock, with the other choice located on the opposite side of the inlet at the end of 44th Drive. The city's Economic Development Corporation President Maria Torres-Springer said they chose the Gantry Park site because it's closer to the most populated parts of Hunters Point. "It's going to be a lifeline vital to the thousands of residents who live in the dense residential corridor," she said, adding that the future landing is projected to see the highest ridership numbers of any ferry dock outside of Manhattan, or an estimated 4,000 riders a day. Assemblywoman Catherine Nolan had previously questioned the idea of putting the new dock in Gantry Plaza State Park, saying doing so could overcrowd or detract from the parkland. "I do want to be sure, and I know I will be looking very carefully...to make sure that it is not something that in some way, either environmentally or in an open space way, hurts the existing parkland that we have," she said Monday. The EDC said that it will work to minimize the impact the dock has on the park. The future Long Island City North station will be part of a new ferry route set to launch next year that will connect to Astoria, Roosevelt Island, East 34th Street and Wall Street/Pier 11 in lower Manhattan. Rides will cost $2.75. The line will be run by the company Hornblower, which will also take over operations of the East River Ferry's existing routes, lowering the the cost for service on those lines to $2.75 as well, according to the EDC. It's one of five new routes and 10 new ferry landings planned across the boroughs, as an effort to create more transit options for residents in some of the city's fast-growing waterfront neighborhoods. Elected officials say the service, expected to start operating in the summer of 2017, should help alleviate overcrowding on the nearby 7 train. "Anyone who takes a look at the Vernon-Jackson stop on the subway, it's already beyond capacity. People have to wait on the stairs to get on the platform to eventually get on the train," State Sen. Michael Gianaris, who represents the area, said Monday. "So this is a welcomed bit of relief here." Editor's Note: A previous version of this story incorrectly stated that the new Citywide Ferry service would operate separately from existing East River Ferry service. 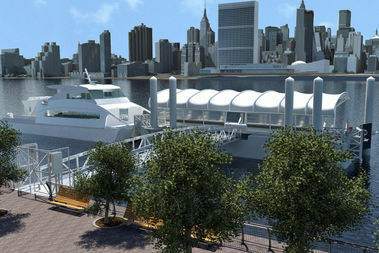 East River Ferry service will be integrated into the Citywide Ferry service, which will be operated by Hornblower.